Students have scattered this summer to tackle their various studies and internships, but it doesn’t mean campus has taken a break from showing off. One of the leading college guidebooks for the United States, Canada and Great Britain has just chosen us in several sought-after categories. 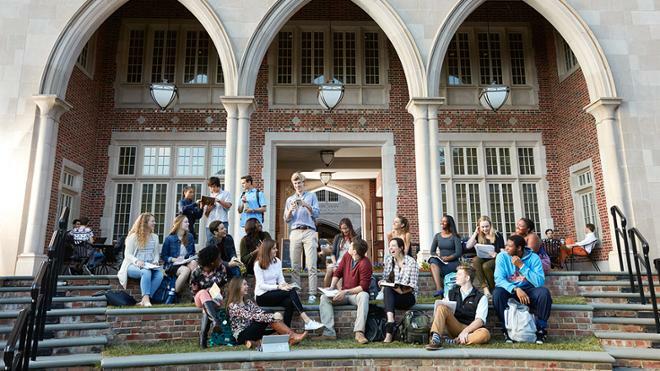 “Students at the University of Richmond enjoy a healthy mix of Southern ambiance and intellectual rigor that includes small classes, close friendships, and lots of teamwork,” the Fiske Guide to Colleges notes. Richmond received several shout-outs along with inclusion in the “preprofessional” and “forward-looking campus” categories. Highlights include our First-Year Seminar with faculty on topics ranging from bioethics to art history, as well as our Sophomore Scholars in Residence program that combines a yearlong interdisciplinary course, a group capstone in the spring, and various opportunities for community-based activities and domestic or international travel. The guide also touts UR’s commitment to “globe-trotting” with 63 percent of undergrads studying abroad with university support. We partner with 75 institutions in more than 30 countries to enable these kinds of global opportunities. We are thrilled to be recognized for some of our most influential programs!